The thought of being involved in an accident with a semi-truck is scary, and a quick look at the numbers reveals a terrifyingly-high rate of accidents involving 18-wheelers. Every 16 minutes, someone is killed in an accident involving a semi-truck. A shocking nine percent of these occur in Texas. The Fatal Analysis Reporting System (FARS) reports that 4,067 people were injured or killed in accidents involving semi-trucks in 2015 alone. Even when these accidents are not fatal, they tend to have more devastating injuries because of the sheer weight and size of semi trucks compared to passenger cars. There are numerous contributing factors to truck accidents. Many of these involve issues with the truck itself, including overloaded trucks, over-sized trucks, brakes that have not been properly maintained, and insufficient safety devices (eg. reflectors and lights). Also, because of their size and weight, these trucks make much wider turns and take far longer to stop than regular vehicles. Semi trucks are often operated by drivers that have been on the road for long hours or who have worked through their designated rest times. Sometimes the drivers have not been properly trained or just make poor safety decisions such as driving fast in low visibility or inclement weather, driving irresponsibly in regards to speed or aggression, driving under the influence of alcohol or drugs, or failing to yield. Unlike with most passenger vehicle accidents, the operator of a semi-truck is often not the owner. There are also many more regulations placed on semi-trucks than on regular vehicles, and there may be more than one insurance company covering the vehicle and/or trailer. Determining liability and navigating such a claim can be extremely complex, and is best left in the hands of an experienced attorney. It is also important to be aware that there are time limits on filing a claim of this kind. 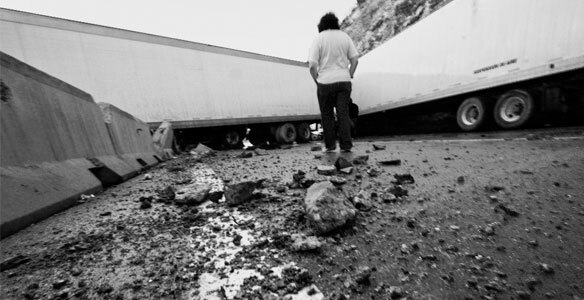 If you or a family member has been involved in an accident involving an 18-wheeler, it is always in your best interests to speak with an attorney before attempting to handle your claim.